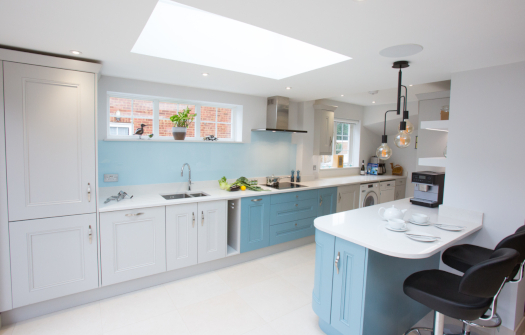 Combining a palette of pale grey and blue created this stylish classic kitchen. Wishing to blend three rooms into one living space our clients wanted to create a versatile yet functional space to cook and entertain within. Combining the kitchen, dining and breakfast areas was desired to increase not only storage but also as keen cooks the worktop space. Enjoying their retirement gave them more time to indulge in their passion for cooking so the new kitchen needed to accommodate zones for them both. They were looking for a design that wasn’t too traditional rather a sophisticated classic feel to the room using a palette of coastal colours. Designing an open plan space that also offered storage and a more zoned approach was achieved by knocking down dividing walls to open up the room. 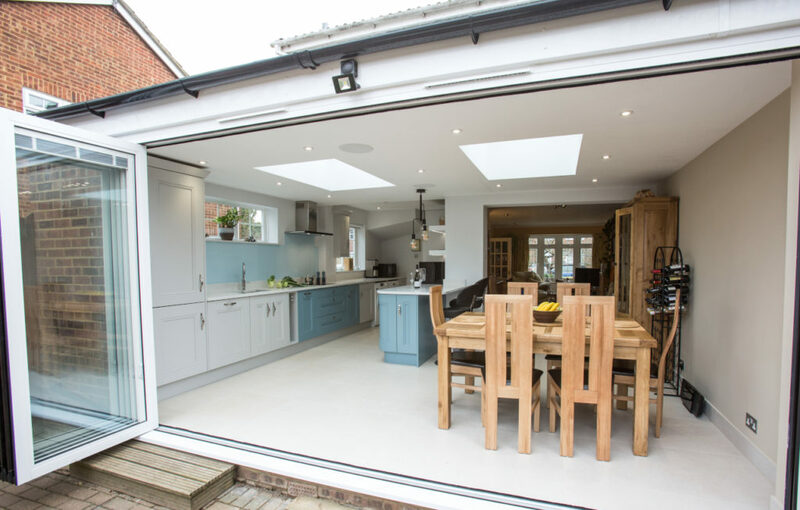 To increase the light further bi fold doors were taken across the back of the house along with an extra sky light added by their builder. The overall design was an L shape room that allowed for a separate dining area. The inclusion of a breakfast bar also created a specific zone for eating as well as increased work space when needed. This created a subtle wall between one zone and the next without losing any light or sense of space. 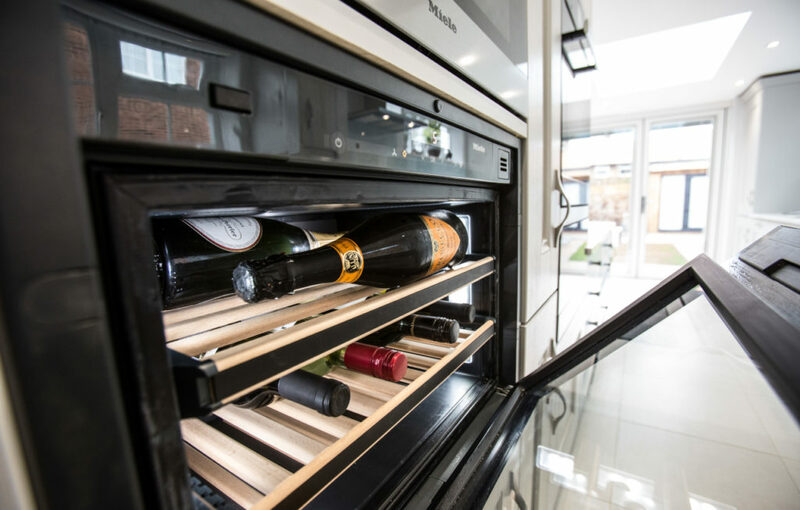 New appliances were incorporated into the design including a steam oven for these keen cooks, a built in coffee machine and a wine cooler. 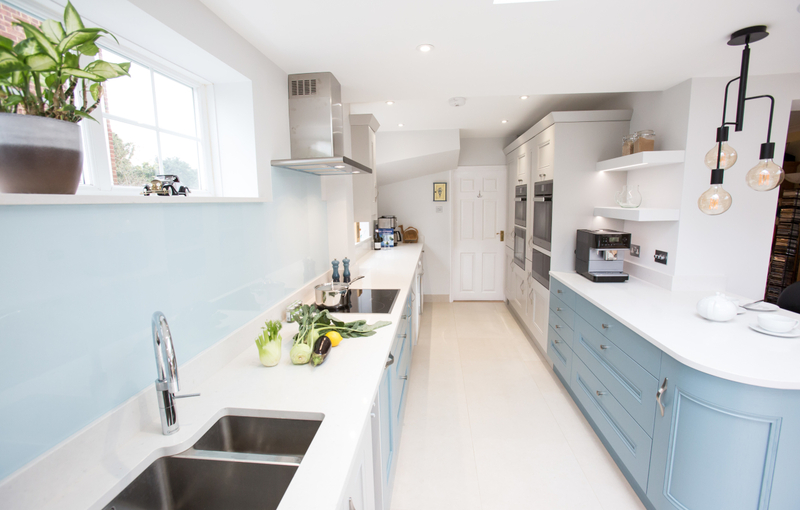 Beautiful cool tones of pale grey and blue were integral to the overall design which are a popular combination. 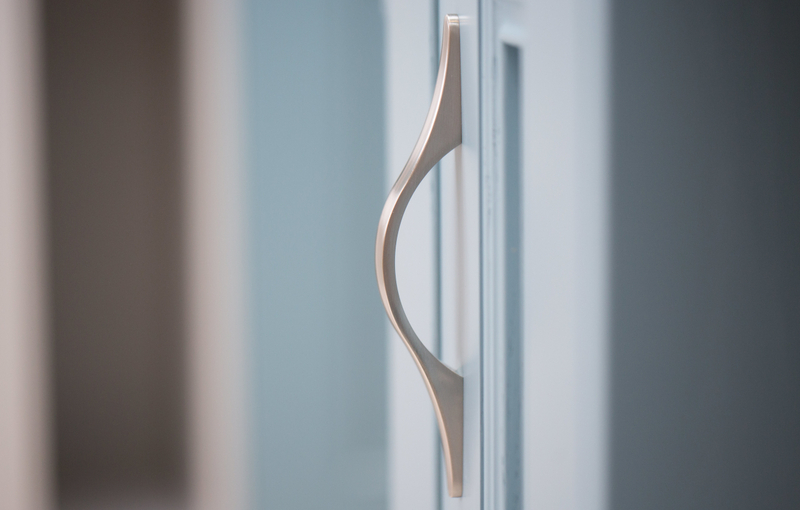 Painted shaker units with a beading detail on the doors were chosen in two tones. 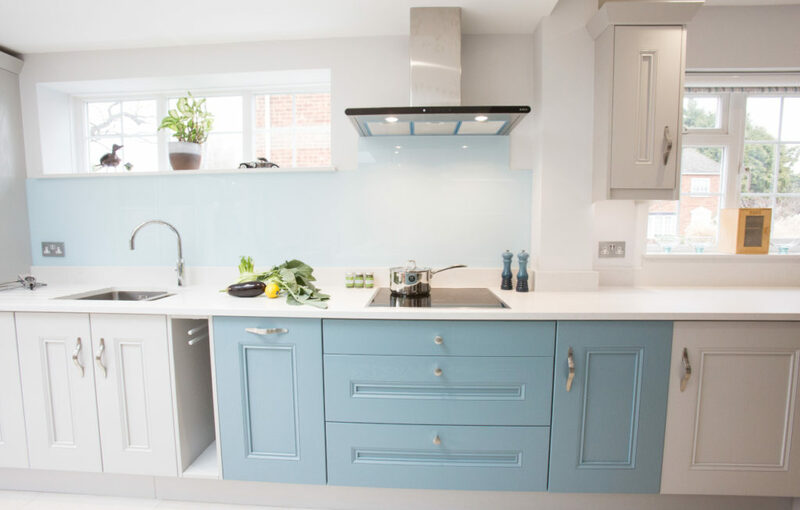 Pale grey providing the character and unity to the design whilst a subtle contrast of blue to base cabinets added the second accent colour to this classic style. 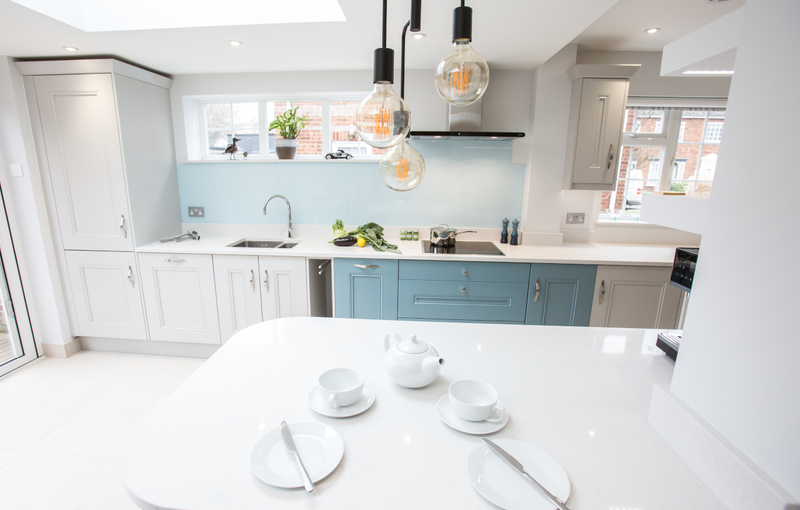 To retain the light and airy feeling of the space marble effect Caesarstone Quartz worktops offered a sophisticated practical surface whilst continuing the coastal scheme. Keeping the look simple, hints of pale grey and blue were added throughout. Lighter tones were added to the walls and porcelain floor tiles positioned throughout to make the scheme flow naturally. Modern accessories and pendant lights added the finishing touches to this sophisticated kitchen. Bringing classic modern style to this 1970’s mock Georgian house with an airy and natural flow throughout the ground floor. The open plan kitchen answered all our clients’ needs – modern living, light, increased storage and a versatile cooking space. 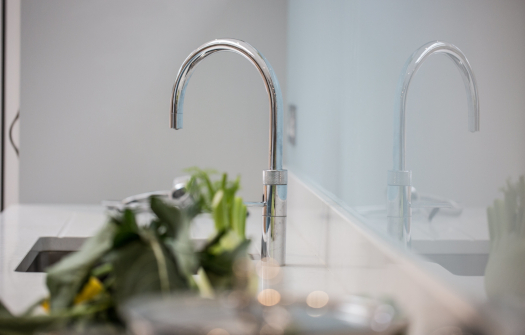 The spacious and long runs of worktop allowed the couple to both cook, giving them the opportunity to individually create delicious meals and entertain friends and family at the same time. The grey and blue colour palette created a tranquil and spacious backdrop reminiscent of sunny days by the sea to this classic coastal chic kitchen. 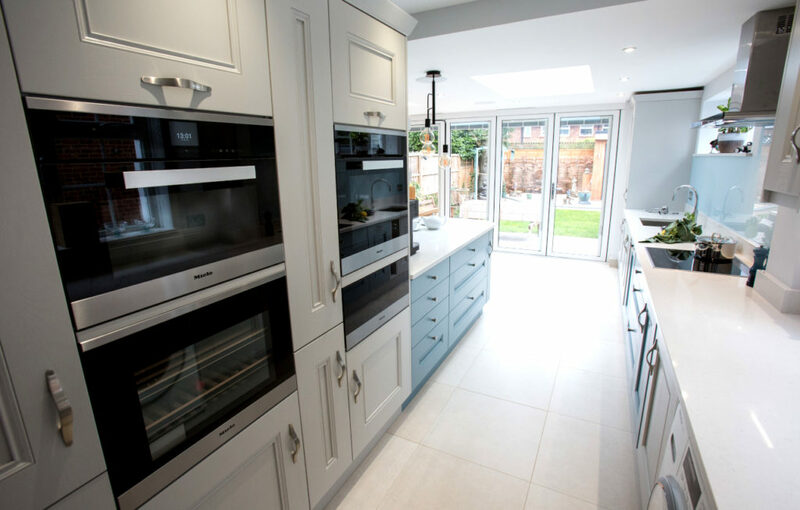 Contact us today to create your dream kitchen on 01932 255465, email or visit our showroom for a free consultation.